History is like life; it’s sequential, but it’s also full of variety, full of life. The Greek historian Herodotus (484-414 BC), known as the “Father of History,” wrote about ancient Egypt, Persia, and Greece. It has been said of him that he broke new ground in his histories in that he didn’t merely sequentially document facts concerning the war between Persia and Greece, he dug deeper examining the causes of the war. He incorporated into his accounts surrounding information that shed light on the conduct of the war and the personalities of those who waged it. That’s what makes Herodotus a good read; he didn’t just record events, he went below the surface to find the reasons and motives behind the events. Herodotus brought history to life! The word “histories” in Greek means “inquiries”. To inquire means a whole lot more than documenting places, dates, and events. To inquire is to ask questions, to interrogate. “What happened” is the event. But a good historian asks, “Why did that happen?” What makes for good history is when the historian “inquires” into the underlying causes that move people to act in any given time or place. It’s not so much the locations and dates which create the events, but the thinking, beliefs, and character of the people. The study of history is essentially the study of man and his beliefs; the events are the results of those beliefs. What should characterize the historian, history buffs too, are empathy and a love for humanity, in spite of all its faults (Re-read Schaff’s quote at the beginning of this article). 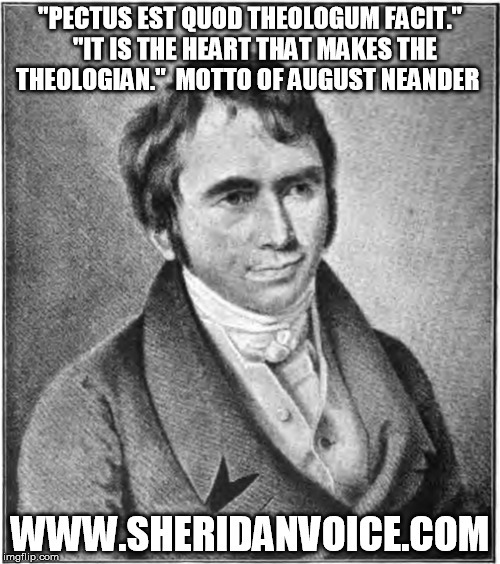 That Latin phrase translates, “The Heart Makes the Theologian.” No wonder his work touched hearts! The combinations of heart and head make history live! We can see this vividly illustrated when we compare and contrast Neander with one of his contemporaries, J. C. L. Gieseler, the Professor of Church History in Göttingen. Both worked on their valuable Church histories at the same time. Gieseler, however, wrote under the influence of German rationalism, a philosophy which affected his narrative. He didn’t have the heart of a Neadner, so his writings, though valuable, were dry and uninspiring. The lesson of Neander applies to all of life. In sports they tell you, “You’ve gotta have heart”; in music, “You’ve gotta have heart”; the list of fields go on – you’ve got to have heart in just about every endeavor or it will be cold, mechanical, and uninspiring. This means, sticking with the athlete and musician analogies, you have to know more than the technicalities of the game or the music, you’ve got to play them with passion, with heart. Just as historians with heart inspire readers, people who live with heart will inspire observers.